Arson leads to murder in this fourth book in the Constable Evan Evans series. Constable Evan Evans of the North Wales Police is on a hike at the beginning of this story. He is not alone. “If anyone was sheltering up on the mountain, it was probably nothing more than a passing tramp or a courting couple from the village, which would explain the tension and watchfulness he sensed.” To his relief, he encoutners a familiar face. But Mr. Owens was not the only soul in the wilderness. When Madame Yvette opens a fancy French restaurant in a converted church—riling up one of the local pastors—surely it’s only a matter of time before the arsonist strikes again. Yvette tries to endear herself to the local populace by offering free French cooking classes to the ladies, but the men in town find the portions too small and an affront to fine Welsh cooking. When she receives a threatening note, Yvette calls Evan to investigate. But the late night call turns into something more as Yvette tries to get Evan to stay the night. He declines. Though Yvette’s later boasting of the visit upsets Evan’s love interest, Bronwen. After clearing up the misuderstanding—oddly—takes Bronwen to dine at Chez Yvette. “I want her to see us together,” Evan tells Bronwen. All is well, but the couple notice a man in an alcove of the restaurant and notice how flustered Yvette seems after having spoken with him. Later that night, the restaurant burns down and the body of an unidentified man is found in the upstairs living quarters. Has arson turned to murder or is there something more? Fortunately, there is a murder here, but it doesn’t occur unitl some eighty-odd pages in. That’s when the story truly takes off with false identities, drug trafficking, and a missing boy who may have seen the killer. Though it all remains fairly soft-boiled. Evan and Elle is a diverting story. It’s not as strong on the mystery as it is on the quirky characters. Reading the series from the beginning might very well alleviate the seeming slow start of this fourth book. Regardless, Evan is an engaging character who begins to question his career choice of being a constable in a provincial town. In many ways, he’s the male precursor to author Bowen’s other detective, the spunky Molly Murphy. 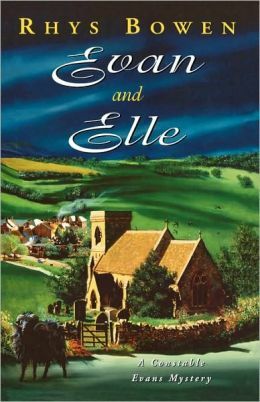 Reminiscent of M. C. Beaton’s Hamish Macbeth and Jan Karon’s Mitford series, the Constable Evans series will very likely appeal to fans of both. Rhys Bowen is the pseudonym of Janet Quin-Harkin. After penning several young adult novels, the British-born author began writing mysteries in the 1990s. Though the Constable Evans series seems to have ended in 2006, her Molly Murphy and Lady Georgiana “Her Royal Spyness” series are still going strong.